At ODC Theater, we’re in the practice of dreaming the culture forward with artists. Of modeling new ways of being together, and becoming responsible to what we see and hear collectively. Here we consider the promises, risks, and urgencies of assembly at this moment, and how gathering at the theater shapes economies of time, attention, and experience, with the possibility of becoming more meaningfully connected. As a crossroads for local and visiting dance artists, ODC Theater serves as a site of generative vibrancy for performance. The 2019 theater season proposes imaginative worlds and strategies for our times: rituals for navigating uncertainty, perspectives on labor and dignity, embodied song for healing and undoing habits, and dance as a way of knowing. Onstage you’ll see new work by Katie Faulkner and Risa Jaroslow, as well as projects by Adia Whitaker and Tere O’Connor. Theater Unplugged brings you into the process of Larry Arrington. And this summer, the annual Walking Distance Dance Festival features West Coast choreographers including d. Sabela Grimes, Kinetech Arts, Barak Marshall, Mary Armentrout, and our flagship company, ODC/Dance. Additionally central to ODC Theater’s mission is a commitment to supporting the artists we grow. In 2017 we welcomed new resident artists who will have a creative home on this dance campus for three years to evolve their craft, provoke the community, and bring new performance work to life. I hope you’ll meet these artists both on and offstage in the coming months: Larry Arrington, Antoine Hunter, Daiane Lopes da Silva and Weidong Yang of Kinetech Arts, and Lauren Simpson. Finally, we are dedicated to the public and think of our time together as a collaboration. The ODC Theater Institute is a series of shared practice sessions with select visiting artists, offering opportunities to learn creative tools and techniques. ODC Theater is also excited to be part of a special partnership with Hope Mohr Dance’s The Bridge Project, the Merce Cunningham Trust and SFMOMA’s Open Space for Bay Area Artists Respond to Merce at 100 this fall. Please join us to cultivate ODC Theater as a shared enterprise of creative discovery, awareness and respectful negotiation. Help us make the physical and tangible exchanges at this site potent with celebration, thought, curiosity, improvisation, deliberation, care, and, of course, dance. Why dance? At ODC Theater we return to this question everyday. And the reasons reveal themselves through the perspectives and work of the artists in our midst. Emerging from considerations of humor and criticality, creative habitats, grand gestures and the consequences of care, the 2018 season is full of new contemporary performance work and an invitation to direct your time and attention, consider channels for resilience and regeneration, and be with the beauty, difficulty, ambiguity and contradiction embedded in art. The 2018 theater season features premieres by dynamic performance makers from across the country: Cori Olinghouse, Catherine Galasso, Sara Shelton Mann and Bobbi Jene Smith. Our annual May festival gathers such dance artists as Yara Travieso, Byb Chanel Bibene, Belinda McGuire, Rashaun Mitchell and Silas Riener, with collaborators across disciplines. Theater Unplugged brings you into the process of Katie Faulkner’s new work, and Summer Sampler features flagship company, ODC/Dance. Additionally, central to the ODC Theater’s mission is a commitment to supporting the artists we grow. Our resident artists, Gerald Casel, Nicole Klaymoon, Maurya Kerr and Lisa Wymore/Sheldon Smith, work longitudinally over the course of three years to evolve their craft, provoke the community and bring new performance work to life. 2018 marks the conclusion of this cohort’s ODC Theater residency, with three of these choreographers premiering commissions in June. We are also dedicated to our publics at this dance-led creative center. Here for each other, we do this work in relationship. ODC Theater is excited to be part of Limited Edition: Forward Looking Lineages, a special partnership dedicated to performance in San Francisco during the beginning of 2018, initiated by Open Space, SFMOMA's contemporary arts and culture platform, along with CounterPulse, The Lab, Performance at SFMOMA, and Z Space. At ODC Theater, you can see dance just about every week of the year. Coming together at the theater we can imagine new possibilities, be engaged and challenged, and celebrate along the way. Join us to cultivate this potent space for expressions of the body, connection, and reflection. And please do make dance a habit. At ODC Theater we’re always moving, with hundreds of artists in our midst each year. This season, ODC Theater traces shifting perspectives, as artists push us to think and feel more, and differently, through dance encounters, vibrant dialogue, and opportunities for connection. To be curious is to be unsure that one knows, a little empty and eager to learn. So whether you’re a dancer, designer, doodler, or daydreamer, we invite you to renew your perspective by opening yourself to art. How do we consider the spaces we inhabit? The places where we meet? How can live gathering develop our capacity for human kindness? The 2017 theater season features work by dynamic artists from across the country: David Gordon and Kate Weare, as well as projects generated by local companies RAWdance and Smith/Wymore Disappearing Acts. We are also excited to present the Walking Distance Dance Festival composed entirely of West Coast premieres by Bay Area artists: FACT/SF, The Foundry, Fauxnique and tinypistol. Summer Sampler features ODC/Dance and Theater Unplugged engages the process of Epiphany Productions. ODC Theater is invested in expressions of the body and cultural discourse. The body, unfixed, lends itself to a spirit of inquiry and possibility. Additionally, central to the ODC Theater’s mission is a commitment to artists. Our resident artists, Gerald Casel, Nicole Klaymoon, Maurya Kerr, and Lisa Wymore, work longitudinally over the course of three years to evolve their craft, provoke the community, and bring new performance work to life. We are also dedicated to our publics at this dance-led creative center. We are a host site for Civic Dinners, a national project asking big questions that invite personal reflection, storytelling, and action. Lobby exhibitions curated in partnership with artists performing at the theater provide a space for amplification and socializing. And for an illuminating look at process behind the scenes, check out ODC Dance Stories by ODC’s Writer in Residence, Marie Tollon. Finally, I’m thrilled to begin the 2017 season as my first at ODC Theater and to cultivate ways to look, to give attention, to be in community, and to make meaning. This year at ODC, I hope you enjoy potent experiences of dance and exchange. Please join us to nurture that which is vital and embedded in this live art! SALTA's party with rules, december 18, 2014. photo by tommy lau. In a city of innovations, iterations, and makers, this ConVerge mines that which is on the other side of productivity. 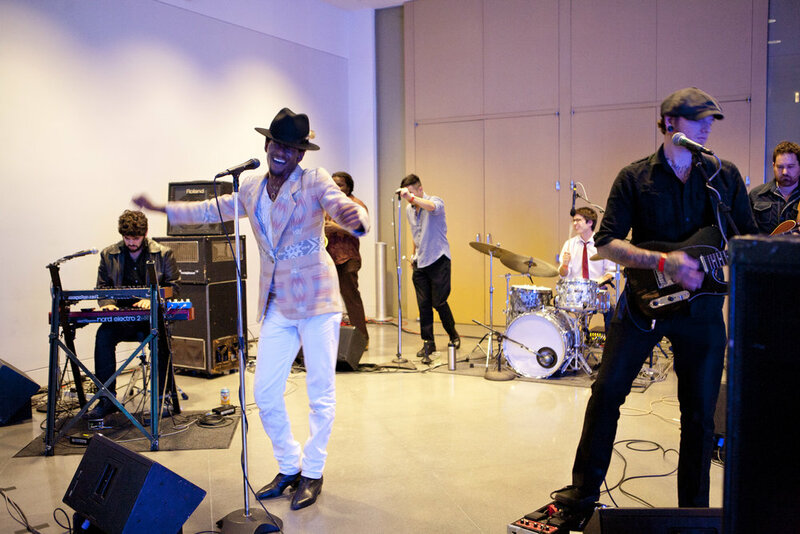 Featuring SALTA hosting A Party with Rules, Artists Respond to Art: Performative Gallery Tours by Mica Sigourney, Rachael Dichter, and Philip Huang, and live performance by Con Brio. Join us to get a taste of YBCA:You with live art, free drinks and Bi-Rite catering for all to celebrate the winter season and the end of 2014.
hope mohr dance at ybca in "ridetherhythm", december 19, 2013. photo by tommy lau. This YBCA:You-hosted ConVerge features an evening of wordplay with Hope Mohr Dance, Megan Brian, and San Francisco writer and comic Joe Veix. Double meanings make for witty amusement and miscommunication, whether spoken, written, texted, or sung. As words fall differently on different ears, this evening of art and words mines the effort, surprise, and failure of communication. At 6 PM, YBCA:You will offer a free 30-minute Art Savvy tour. 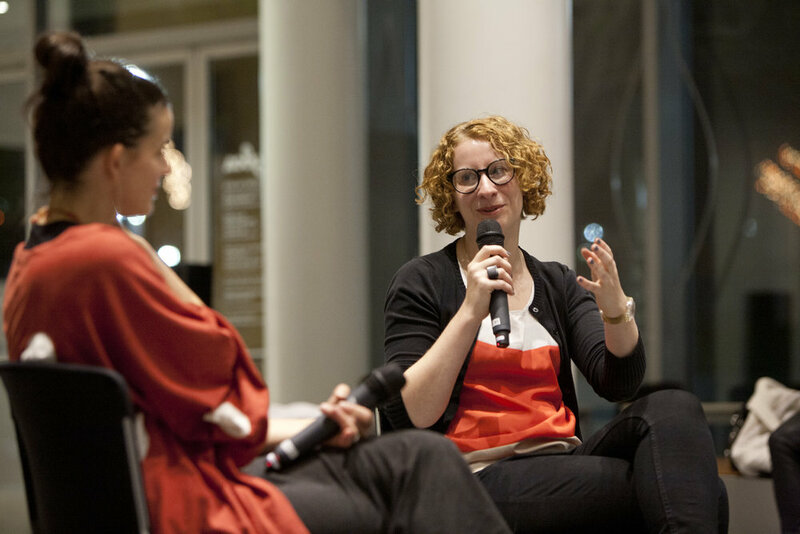 At 6:30 PM we'll reveal the YBCA:You lounge and Hope Mohr Dance performs in the lobby followed by Words on Word/Play, a conversation with Megan Brian. ConVerge will feature free drinks and Bi-Rite catering for all to celebrate the winter season and the end of 2013.